Hundreds of 'Star Wars' fans participated in sci-fi themed speed dating events at the Star Wars Celebration V in Orlando, Fla. Here, a sign welcomes the romance-seeking 'Star Wars' fans. ORLANDO, Fla. ? Amid the droid races, costume contests and paneldiscussions, some devoted "Star Wars" fans tried their luck atfinding romance with ? of all things - sci-fi-themed speed dating. The participants, many of whom were dressed as Jedi knights, stormtroopers and the indomitable Princess Leia, sat opposite one another for a series of 3-minutedates, in hopes of finding a connection with a fellow "Star Wars"enthusiast. Two speed dating events were planned for the four-day-long Star Wars Celebration V convention here, but the sessionswere so popular that the organizers added an impromptu third gathering to theschedule. All's fair in love and "Star Wars"
In total, over 260 "Star Wars" fans took part in the speed datingsessions, which were open to heterosexual and homosexual participants. The males and females remain anonymous throughout the string of dates ?identified solely by nametags with assigned numbers. The participants record the number of anyone who captures their interest. After time runs out on all the dates, the males and females write theirpreferred method of contact on envelopes that correspond to the number assignedto any participant they wish to see or hear from again. This way, contactinformation is only divulged to those who have sparked a person?s interest. These precautions are meant to maintain the safety and comfort of thedaters. 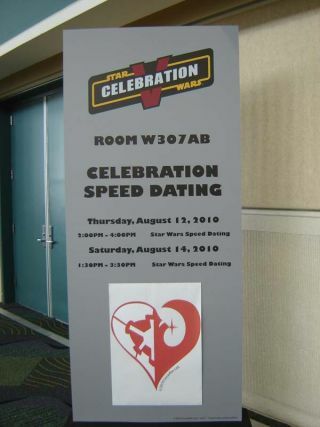 This was Glitch's first time organizing and hosting speed dating sessions atthe annual "Star Wars" Celebration convention. And, it largely happenedby accident. Glitch, who is single, submitted the idea for such an event online, hopingto see it run so that he could meet someone. After several e-mails wereexchanged back and forth with the "Star Wars" Celebration Vorganizers, Glitch found himself at the helm of the dating extravaganza. "It was an accident," Glitch said. "Well, it was pure luck ?a will of the Force, you could say." The feedback from the three events has been very positive, Glitch said, andhe is aware of nine possible success stories that have come out of theexperience. In fact, at a separate convention event, Glitch saw eight couples that weremade up of people who had attended his speed dating sessions. In the main exhibition hall, a "chapel" was set up to allow "Star Wars" fans toprofess their love and devotion to each other in the form of commitmentceremonies. "I've been told that we?ve had two commitment ceremonies from peoplethat met at my event," Glitch said. "I don't know for sure, but I'vebeen told that by a couple different people." And, there could a success story on the horizon for Glitch himself. "It's kind of funny," he said. "I'm the host, so I didn'tthink people would be paying attention to me. But, I've had about three or fourgirls per session leave their contact information because they want to hangout."